The US-led bombing campaign in Syria is targeting the Al Nusrah Front, an official branch of al Qaeda, as well as the Islamic State, an al Qaeda offshoot that is one of Al Nusrah’s fiercest rivals. Before they were launched, the air strikes were framed as being necessary to damage the Islamic State, a jihadist group that has seized large swaths of territory across Syria and Iraq. But in recent days US officials signaled that they were also concerned about al Qaeda’s presence in Syria, including the possibility that al Qaeda operatives would seek to use the country as a launching pad for attacks in the West. Several well-connected online jihadists have posted pictures of the Al Nusrah Front positions struck in the bombings. They also claim that al Qaeda veterans dispatched from Afghanistan to Syria, all of whom were part of Al Nusrah, have been killed. US intelligence officials contacted by The Long War Journal confirmed that the Al Nusrah Front has been targeted in the operations, but could not verify any of the specific details reported on the jihadist sites. Among the Al Nusrah Front positions targeted in the bombings are locations where members of the so-called “Khorasan group” are thought to be located. Ayman al Zawahiri, the emir of al Qaeda, sent the group to Syria specifically to plan attacks against the US and its interests. The group, which takes its name from al Qaeda’s Khorasan shura (or advisory) council, includes experienced al Qaeda operatives who have been involved in planning international terrorist attacks for years. The New York Times reported earlier this month that al Fadhli is a leader in the Khorasan group in Syria. 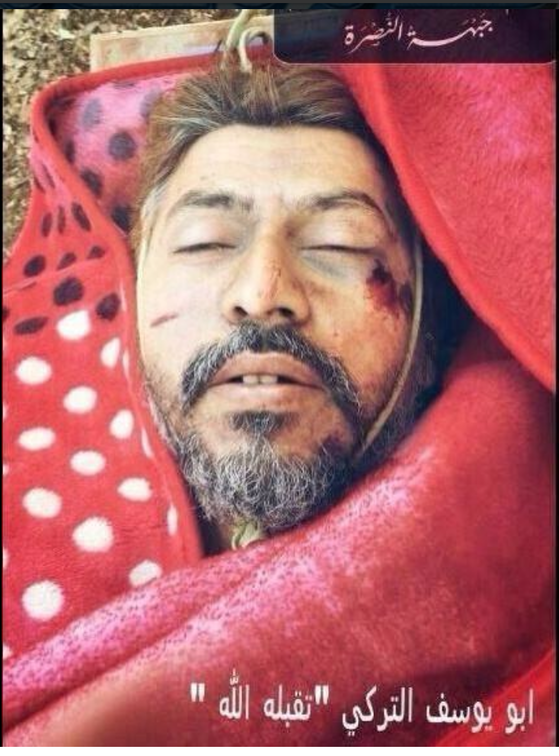 Unconfirmed reports on jihadist social media sites say that al Fadhli was killed in the bombings. Neither US officials, nor al Qaeda has verified this reporting. The fog of war often makes it difficult to quickly confirm whether an individual jihadist has been killed, wounded, or survived unscathed. Initial reports should be treated with skepticism and there is no firm evidence yet that al Fadhli has been killed. Jihadists claim that the man shown in the photo to the right is known as Abu Yusuf al Turki, an Al Nusrah “commander” who trained fighters how to become snipers. Al Turki fought in Afghanistan and Iraq and was supposedly killed in the US airstrikes. One of the twitter feeds reporting al Turki’s death is associated with Sheikh Abdallah Muhammad al Muhaysini, a popular Saudi cleric who is closely tied to Al Nusrah. The feed, which has more than 250,000 followers, provides news on events inside Syria and is also used by the jihadists to raise funds for their efforts. The feed has posted a series of updates since the bombing campaign began. In addition to the photo of al Turki, the Twitter page tied to Muhaysini also posted a picture of a building that was reportedly controlled by Al Nusrah in Aleppo before being struck in the bombings. According to the feed, and others, dozens of Al Nusrah Front fighters and leaders have been killed. Obama has now sided with Syria, Iran, and Russia, whether he admits it or not. Oops, but then again it was either IS or Iran’s shia alliance. There was no third option. YPG/PKK are idiots and Turkey considers them terrorists worse than IS for a very good reason, 30,000 civilians killed by PKK/YPG. PUK and now PJAK are Iranian Clients. KDP is useless and fled at the mere word IS was gunning for them at Sinjar, and now they are losing ground again despite all the aide given to them. The Kurds were never a viable option. FSA: More like alphabet soup of corrupt fractious groups whose only agreement is that Assad has to go. Not much use. Sunni Tribes: Uh, the majority of the fence sitters have basically decided to either sit the fight out or join IS. Its too late to flip them as they don’t see a viable alternative between a murderous Assad and Iraqi Government and the Harsh but non-corrupt IS rule that provides services and social outreach despite their draconian law and order. Even so, as Yemen, Afghanistan, Vietnam, and Somalia demonstrated, unless we are willing to own the land, exile our sons and daughters for the duration, it doesn’t matter what we do, we’ll lose, our foes will take over and our troops died in vain. Oil is not worth American Lives, keeping a dominant position in the world is not worth American lives, affairs in other nations are not worth American lives. Only a direct existential threat to our sovereignty should be worth a war. A pin prick like 9-11 is not worth a full scale war and considering the Taliban were willing to turn Osama over to the Hague, the Afghan war was totally unnecessary and got us into a losing war with the Taliban who had nothing to do with 9-11. Why might you ask they can accomplish victory despite all the odds against them? Answer: They refuse to surrender and are more willing to die for victory than we are willing to live for victory. This youtube vid sums up exactly what IS is about and why it is so successful. They are true believers. Just watch flames of war and their other propaganda videos. They know thy are dead already and they don’t care, they won’t surrender and they know we’ll run out of money to fight them long before they run out of fighters. This war is only just getting started. Is the “so-called ‘Khorasan group'” strictly a term of art? The NYT piece acknowledges there is little public intelligence; the piece in the Weekly Standard seems to take this a step further calling the group core al Qaeda. Is this moniker an invention for political purposes? In re Tom: Osama Bin Laden swore fealty to Mullah Omar, if you think the Taliban had nothing to do with 9/11 your detached from reality. They facilitated it by providing a safe haven for AQ to train and operate in. If you don’t think its sound to destroy barbarians who openly state that they aim to conquer the earth no matter the cost to themselves, i wonder what you think a legitimate threat really is. And if you don’t think it is a legitimate threat that needs to be dealt with, i urge you to read a good book on the history of the Roman Empire. The politicians in that state didn’t think much of the barbarians of their era, yet ultimately they led to their doom. This gives substance that the US had permission from the Syrian Government to conduct strikes inside its territory. A little “scratch our backs, we’ll scratch yours” at play here. The Syrians were smart getting information out that the US/Syrians had discussed this prior. No matter what the US says now, the Syrian’s word was first. We lost more civilians on 9-11 than we lost sailors in Pearl Harbor, which was not a U.S. state at the time. What would be your “red line”? The Europeans and the Arabs were wetting themselves in the first few weeks believing that the US would use their strategic assets. The problems was the US did not initiate “full scale war”. Which leaves us in the situation at present. Very much opposed to getting involved in a Sunni-Shiite civil war, and especially taking the Shiite side. How can this be a war on terror when this is a defacto alliance with Iran, Hezbollah, and Assad? Mind you, Iran is a state sponsor of terrorism and Hezbollah is a terrorist organization that was responsible for the deaths of 240 US troops in the Beirut marine barracks attack. The Shiite militias we have allied with are not only responsible for American casualties , but also for the death squads which have created the sectarian environment in Iraq, paving way for extremists like ISIS to flourish. Last I checked, Bashar Al Assad is a dictator that has overseen the deaths of 200,000 Syrians, mostly Sunnis. A genocide. It is worth remembering the conflict in Syria began after Bashar Assad and his forces started a violent crackdown on the protests , using his airforce to that end. The best strategy was to stay out of this, to evacuate our personnel from Kurdistan, close our embassy in Iraq, and day adios. We do not have the financial capacity to be involved in a war where none of our national interests are at stake. We have shale oil, so Iraqi oil is no longer a national security interest. Under no circumstances should we be picking sides in what is a Middle Eastern civil war. It is bad for our national security. Can you provide any insight into the Israeli downing of the Syrian fighter jet? This is the first Israeli downing of a Syrian fighter jet in 30 years.